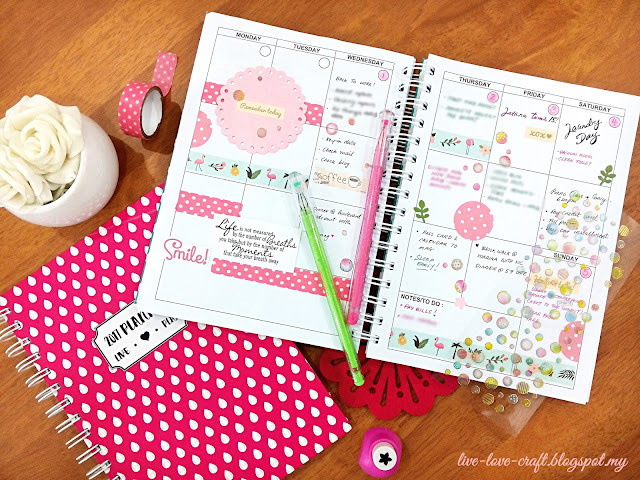 So, back to my planner… This time, I went all girly with pink, polka dots and tropical! 🌼🌿 Lol! How cute are those polka dot pink and tropical (those flamingos, especially!) washi tapes and bubble stickers! I just can’t get enough of them! Since the month of February started off on a mid-week, on Wednesday, and that leaves you with Monday & Tuesday empty, as usual, I just can’t keep my hands off any empty space…and soooo I embellished it with more washi tapes, my favourite quote, sentiment, stickers and a die-cut scallop! Lol! Do you have any certain style of decorating that you love to use on your weekly planners? Do share them with us!